Community policing helped homicides, shootings decline in two neighborhoods. Anita Aydin (left) and Shawn Hudson (center) talk with Shawn Moore on N. 25th Street. Photo by Jabril Faraj. Around dusk on a Thursday night in early August, a group of about 30 black men parade down the 4300 block of N. 25th Street in Garden Homes. 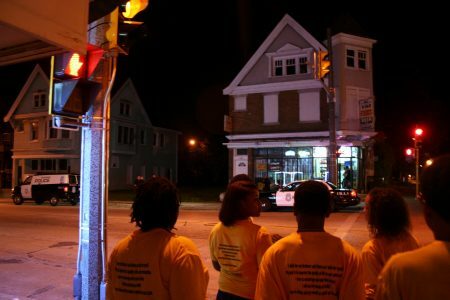 The goal of the group, comprised of Safe Zones ambassadors, members of Muhammad Mosque #3 — some in suit-and-tie and others sporting orange t-shirts emblazoned with the words “Milwaukee Peacemakers” — and employees of the City of Milwaukee Office of Violence Prevention (OVP), is to intervene in a dispute between neighbors. The situation, a territorial dispute between longtime residents and a family that recently moved into the neighborhood, had been growing slowly until it came to a head the night before when the back window of a maroon SUV was shattered by a gunshot, which ambassadors said was clearly a warning. The men, accompanied by Common Council President Ashanti Hamilton, eventually gathered in front of one of the homes; Shawn Moore, a co-founder of the Safe Zones initiative, went to speak with the other party. Monica Hunter, grandmother of the five boys whose family recently moved in, said when the Milwaukee Police Department (MPD) was notified that their neighbor pulled out a gun days before, officers recommended that her daughter get a restraining order. Though police were on the scene immediately after the shooting the night before, Hunter said she didn’t feel any safer. This night was different. There will always be disagreements, conflicts and frustrating situations, according to Safe Zones co-founder Khalil Coleman. But he said the display that August night, and the many other mediations ambassadors engage in daily, establish the ability to talk through differences, and avert violence. Hamilton said he was there to see ambassadors in action, and was impressed by what he saw. He called Safe Zones “an investment” and said he believes people can be inspired to take ownership of their communities, and help to make their neighborhood safer, without having to rely on the police. Ambassadors stop at the intersection of N. 27th Street and W. Burleigh Street during a patrol. Photo by Jabril Faraj. Earlier the same day in Garden Homes, Moore and a group of ambassadors strike up a conversation with a group of women on 25th Street who have lived in the neighborhood for years. They talk about the local corner store, undesirable adult activity at nearby Garden Homes Park and how police officers are largely inaccessible to them when they really need help. Toni Eskridge has lived in the neighborhood for about 15 years, at three different houses on the same block. Eskridge recalled a recent instance when two women — a neighbor and someone she didn’t know — got in a fight in front of her home. Her neighbor was being beaten, so she called the police. After waiting for a bit, she called back. According to Eskridge, it took about 45 minutes for a squad car to arrive. 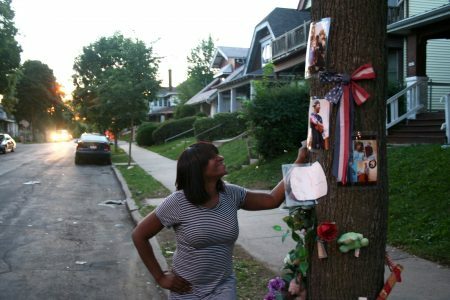 Raquel Russell, 43, a Franklin Heights resident for more than 25 years, stands near a tree adorned with flowers, ribbons, teddy bears and pictures of her son Javontae Buford, 23, who was shot and killed in November 2015. Other young men, friends of Buford who Russell refers to as her children, mill about on the 2400 block of West Auer Avenue. Russell lights up as a team of five or six Safe Zones ambassadors approach her. She uses words like “hope,” “support” and “love” to describe their relationship. “First of all, we embrace — we always hug — then, they say … ‘What do you need? You need anything?’” said Russell. But the conversation quickly turns. The street is alive with activity. Idling cars, bits of litter along the curb and young men, some with drinks, line the street. The mood appears cheerful. “They come here to get together because of him (Buford), get together because this is their neighborhood,” she said. She said police officers need to “stop being so judgmental” and that there needs to be a better relationship between the area’s residents and those who enforce the law. A 40-year-old resident of Garden Homes who identified himself as “Preacher” said there needs to be a balance between enforcing the law and helping youth who may be part of the trouble find a more positive direction. But that balance, he added, doesn’t exist. Raquel Russell stands by the memorial for her son who was shot and killed in November 2015. Photo by Jabril Faraj. The Milwaukee Police Department declined to comment for this story. Russell is excited about the work Safe Zones is doing. She noted that though she loves her neighborhood it could be a little “better-kept,” which, she adds, might change the perception. Still, Russell urged police, and others, to look a little deeper. “[Just] because it looks a certain way doesn’t mean it is a certain way,” she said. Since Safe Zones began in the summer of 2015, resources have been scarce. 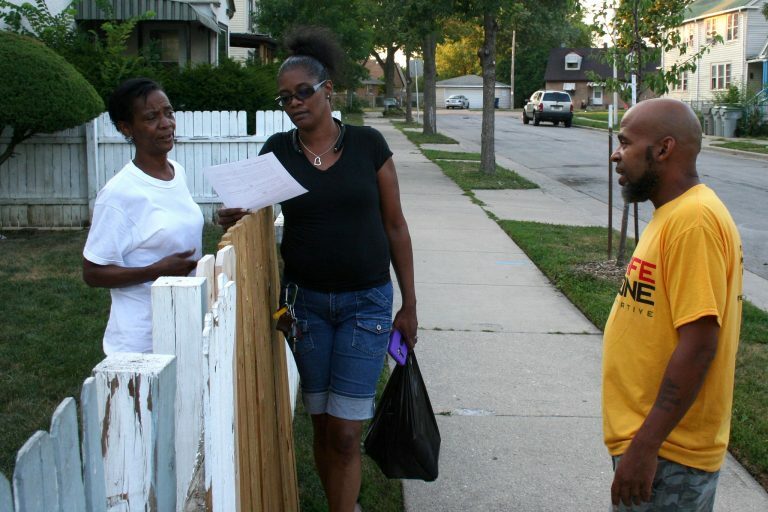 In 2015, Safe Zones received $50,000 in Community Block Grant funds to employ neighborhood ambassadors to de-escalate and prevent potential violence in Garden Homes. The group initially sought $300,000 to work in four neighborhoods. Last year, Safe Zones received $75,000 from the City of Milwaukee, with an additional $37,500 coming from Milwaukee County, to expand operations to Franklin Heights. The 2017 city budget includes another $75,000. MPD, whose 2016 budget was 45 percent of the city’s total budget, will receive $23 million more in 2017 than it did last year. According to Coleman, Safe Zones would be able to operate fully staffed zones in 20 neighborhoods for $5 million. Hamilton, the alderman who has sponsored the initiative, did not respond to requests for comment regarding funding. The initiative, which emerged from demonstrations supporting Dontre Hamilton after his death in 2014 at the hands of a Milwaukee police officer, is largely based on the Cure Violence model, which views violence as a public health issue. Earlier this year, representatives from Cure Violence gave a presentation in Milwaukee on the model and contributed to the weeklong training ambassadors received. A September 2016 report by Cure Violence, which was consistent with multiple independent evaluations, showed that funding cuts to the CeaseFire program are correlated with substantial increases in violence. The Cure Violence model is known as CeaseFire in Chicago. August 2016, Chicago’s deadliest month in almost 20 years, came only 16 months after CeaseFire funding was suspended by the State of Illinois in March 2015, after which staffing levels dropped dramatically. The report estimated a citywide implementation of CeaseFire could save more than $2 billion that is spent on the aftermath of untreated violence. The model, similar to Cure Violence, is to employ people who may have a record, or who have been affected by violence, and are from the neighborhood where they work. Because of the limited funds, however, Safe Zones has only operated for nine of the last 19 months. The bright yellow shirts ambassadors wear while on the clock make them visible, and the fondness of neighbors toward them is clear. As the group patrols on a night in early September, ambassadors receive hellos, handshakes, hugs and even the occasional honk of a car horn. “We’ve just been bonding with the neighborhood and bonding as a team. This job is about building relationships, and that’s what we do,” said Terrence Holmes, an ambassador in Franklin Heights. Holmes, 37, is respected among the group, which includes two 18-year-olds. Experienced as a cement finisher, Holmes is studying masonry. Despite not knowing how long Safe Zones will operate, he chooses to work as an ambassador. The ambassadors all say they love their jobs. And, for most, it’s personal in some way. Some have lost friends and family to violence. Others were once part of the problem and have found a different direction. According to Coleman, the consistency of being there every day and building relationships gives residents, and ambassadors, hope and a sense of belonging. Summone Staples, 18, is one of the youngest ambassadors. After her mother passed, she developed a short temper and would start fights regularly. Staples said she wanted to change but didn’t have an outlet. Then, at the beginning of the summer, her brother told her about Safe Zones and handed her an application. According to data from the city Office of Management Analysis and Planning, between April and September, homicides in Garden House and Franklin Heights dropped 66 percent from 2015 to 2016, with none reported while ambassadors were on the street. Non-fatal shootings were down 40 percent, from 20 to 12, over that same period. From mid-July through the end of August, ambassadors documented more than 430 interactions with individuals, 16 conflicts that were interrupted and 10 successful mediations. Great story. Sounds like a program that deserves support.